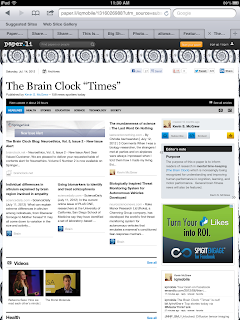 Copyright 2012 Business Wire, Inc. Global education leader Houghton Mifflin Harcourt (HMH) today announced that its Riverside division has released the next generation of the Woodcock Johnson suite of assessment products - the Woodcock Interpretation and InstructionalInterventions Program(TM) (WIIIP) 2.0. The new system provides users with the tools necessary to make sound clinical and instructional decisions across many solutions in the Woodcock Johnson suite of assessments. Whereas some Clinical assessments on the market merely provide the scoring mechanism, the WIIIP 2.0 goes two steps further, giving users interpretation guidance and instructional interventions for each student. WIIIP 2.0 has also expanded interventions to English Language Learners (ELL), empowering educators to overcome language barriers and correctly assess each student. Built to broaden the benefits of earlier versions, WIIIP 2.0 provides an updated database of research-based interventions-more than 500 in total. The assessment will then assist the educator to analyze results to correctly identify disparities between achievement and predicted achievement based on cognitive ability levels. If a learning gap is identified, WIIIP 2.0 provides unique interventions to ensure that each student's needs are met. * New interventions that are included for the Cattell-Horn-Carroll (CHC) cognitive factors, representing dozens of new interventions or accommodations. * New interventions that are specifically intended for English Language Learners (ELL). * Item-level mathematics procedures for two mathematics tests, which help to identify gaps in mathematical knowledge and receive formative interventions to address any underlying undeveloped mathematics skill. * Three reports that can be printed in Spanish, which include the summary, score report, and proficiency profile report. "This new release of WIIIP is exciting not only because it offers new interventions, but because non-native speakers can benefit," said Jim Nicholson, President of Riverside, the testing and assessment division of HMH. "Version 2.0 reflects the needs of today's school psychologists and practitioners." The Woodcock Johnson family of products includes more than a dozen assessments, which are all steeped in years of research and evidence-based inquiry. "Not only does the WIIIP 2.0 meets today's needs, it provides assessment professionals with a bridge to the future - the assessment-intervention link," says WIIIP 2.0 author Dr. Fred Schrank. "The Woodcock-Johnson suite of products remains at the forefront of the assessment-intervention link, and the updated and enhanced version of the WIIIP was created to meet the needs of assessment professionals functioning in, or navigating toward, modern service delivery models." WIIIP 2.0 is available as a kit or a downloadable upgrade for current 1.1 users. For more information on this product or the rest of the Woodcock Johnson suite of assessments, please visit http://www.riversidepublishing.com . Houghton Mifflin Harcourt is a global learning company with the mission of changing lives by fostering passionate, curious learners. Among the world's largest providers of pre-K-12 education solutions and one of its longest-established publishing houses, HMH combines cutting-edge research, editorial excellence and technological innovation to improve teaching and learning environments and solve complex literacy and education challenges. HMH's interactive, results-driven education solutions are utilized by 60 million students in 120 countries, and its renowned and awarded novels, non-fiction, children's books and reference works are enjoyed by readers throughout the world. For more information, visit www.hmhco.com . A PDF copy of this announcement can be found here. Conflict of interest disclosure: I, Kevin McGrew, am a coauthor of the WJ III. Research byte: Support for validity of carefully constructed Cloze reading comprehension test. Three weeks of IQs Corner Recent Literature of Interest were just posted...here, here, and here. As reflected in the figure, all constructs in the CHC model are abilities. As per Carroll (1991), “as used to describe an attribute of individuals, ability refers to the possible variations over individuals in the liminal levels of task difficulty (or in derived measurements based on such luminal levels) at which, on any given occasion in which all conditions appear favorable, individuals perform successfully on a defined class of tasks” (p. 8, italics in original). 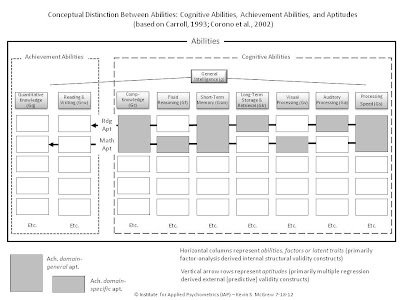 In more simple language,“every ability is defined in terms of some kind of performance, or potential for performance (p. 4).” The overarching domain of abilities includes cognitive and achievement abilities as well as aptitudes (see figure). Cognitive abilities are abilities on tasks “in which correct or appropriate processing of mental information is critical to successful performance” (p. 10; italics in original). The key component to the operational definition of cognitive abilities is the processing of mental information (Carroll, 1993). Achievement abilities “refers to the degree of learning in some procedure intended to produce learning, such as an informal or informal course of instruction, or a period of self study of a topic, or practice of a skill” (p. 17). As reflected in the above figure, the CHC domains of Grw and Gq are consistent with this definition and Carroll’s indication that these abilities are typically measured with achievement tests. Most assessment professionals use the terms cognitive and achievement abilities in accordance with these definitions. However, the term aptitude is often misunderstood. Carroll (1993) uses a narrow definition of aptitude—“to refer to a cognitive ability that is possibly predictive of certain kinds of future learning success” (p. 16; emphasis added). The functional emphasis on prediction is the key to this narrow definition of aptitude and is so indicated by the two horizontal arrows in the figure. 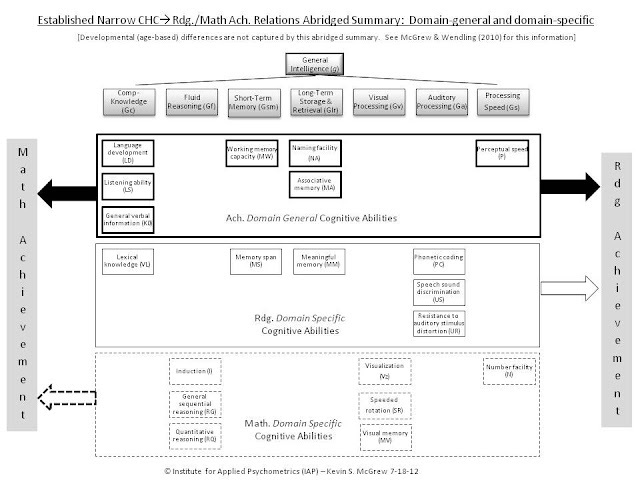 These arrows, which connect the shaded CHC narrow abilities that are combined to predict an achievement ability outcome domain, are the definition of aptitude used in this paper. This definition of aptitude is much narrower than the broader notion of aptitude as reflected in the work of Richard Snow. Snow’s notion of aptitude includes both cognitive and non-cognitive (conative) characteristics of individuals (Corno et al., 2002; Snow et al., 1996). This broader definition of aptitude focuses on human aptitudes which represent “the characteristics of human beings that make for success or failure in life's important pursuits. Individual differences in aptitudes are displayed every time performance in challenging activities is assessed” (Corno et al., 2002, p. xxiii). Contrary to many current assumptions, aptitude is not the same as ability. According to Corno et al. (2002), ability is the power to carry out some type of specific task and comes in many forms—reading comprehension, mathematical reasoning, spatial ability, perceptual speed, domain-specific knowledge (e.g., humanities), physical coordination, etc. This is consistent with Carroll’s definition of ability. According to Snow and colleagues, aptitude is more aligned with the concepts of readiness, suitability, susceptibility, and proneness, all which suggest a “predisposition to respond in a way that fits, or does not fit, a particular situation or class of situations. The common thread is potentiality—a latent quality that enables the development or production, given specified conditions, of some more advanced performance” (Corno et al., 2002, p. 3; see Scheffler, 1985). This broader definition includes non-cognitive characteristics such achievement motivation, freedom from anxiety, self-concept, control of impulses, and other (see Beyond IQ project). 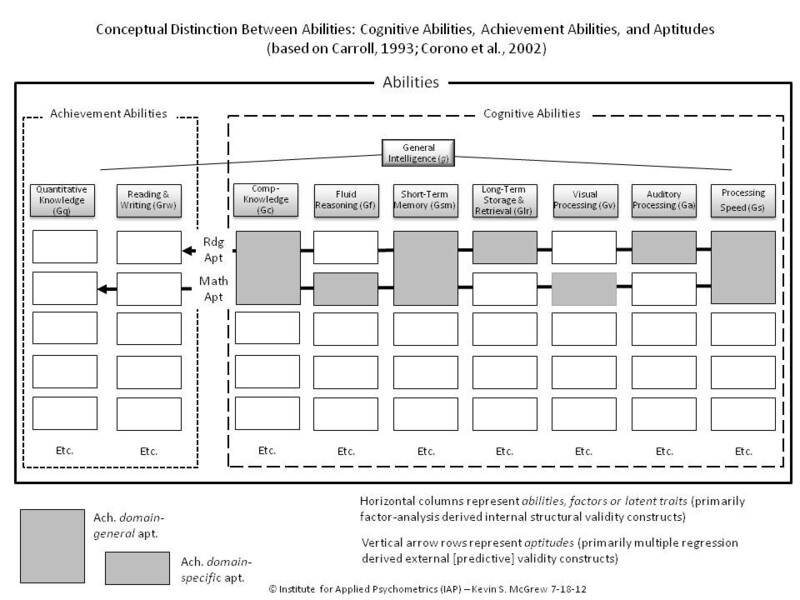 As reflected in the model in the above figure, cognitive and achievement abilities differ primarily in the degree of emphasis on degree of mental information processing (cognitive) and the degree which the ability is an outcome acquired more from informal and formal instruction (achievement). Here, aptitude is defined as the combination, amalgam or complex of specific cognitive abilities that when combined best predict a specific achievement domain. Cognitive abilities are always cognitive abilities. Some cognitive abilities contribute to academic or scholastic aptitudes, which are pragmatic functional measurement entities—not trait-like cognitive abilities. 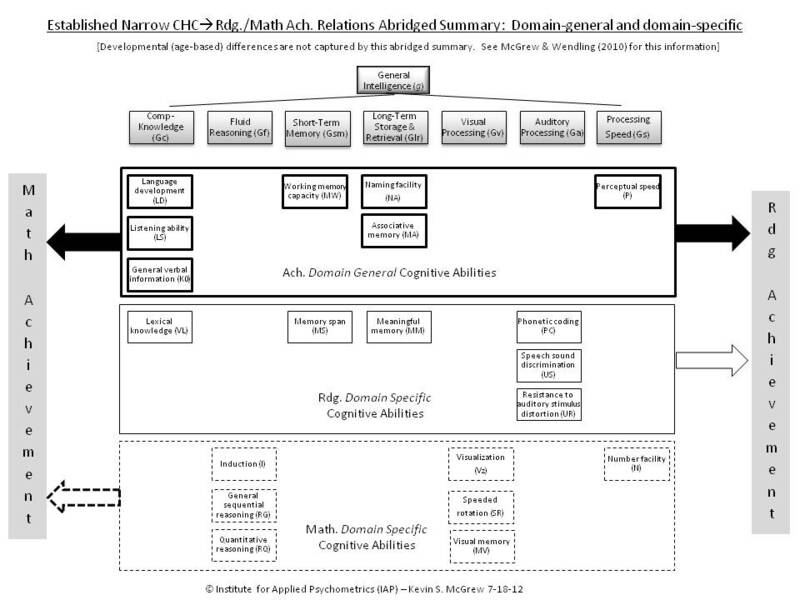 Different academic or scholastic aptitudes, depending on the achievement domain of interest, likely share certain common cognitive abilities (domain-general) and also include cognitive abilities specific to certain achievement domains (domain-specific). A simple and useful distinction is that cognitive abilities and achievements are more like unique abilities in a table of human cognitive elements while different aptitudes represent combinations of different cognitive elements to serve a pragmatic predictive function. For the quantoid readers, the distinction between factor-analysis based latent traits (cognitive abilities) and multiple regression based functional predictors of achievement outcomes (cognitive aptitude) may help clarify the sometimes murky discussion of cognitive and achievement abilities and aptitudes. As noted by Carroll (1993), luminal refers to specifying threshold values used “in order to take advantage o the fact that the most accurate measurements are obtained at those levels” (p. 8). In preparation of a manuscript, I have developed the following visual-graphic summary of Established Narrow CHC-->Rdg/Math Ach Relations Abridged Summary. It is based on the review of McGrew & Wendling (2010). Click on image to enlarge. "Review: Thinking, Fast and Slow by Daniel Kahneman"
In their 2010 paper, Schwartz and Dell advocated for a major role for case series investigations in cognitive neuropsychology. They defined the key features of this approach and presented arguments illustrating the benefits of case series studies and their contribution to computational cognitive neuropsychology. This Special Issue on Case Series in Cognitive Neuropsychology features six commentaries on the Schwartz and Dell paper as well as a response to these by Dell and Schwartz themselves. Editor Brenda Rapp reviews the promises and perils of case series design and places both case series and single-case approaches in their context. Read Schwarz and Dell's original advocating paper here. 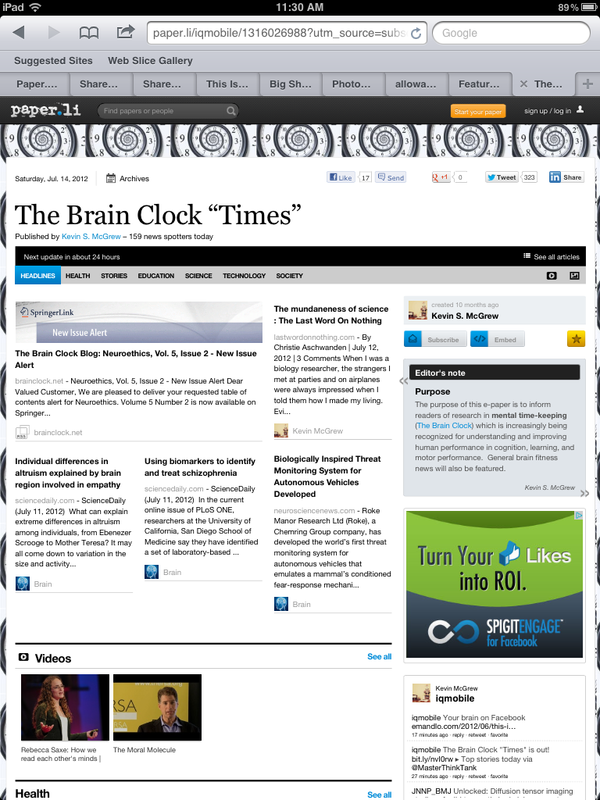 You can get Psychology Press news and updates on Twitter. You can also now get Psychology Press news and updates on Facebook. If you wish to unsubscribe, please click on the link below. A program to help you make sure your work gets off to the best start. The following AP 101 brief was just posted at the ICDP blog. Coffee is a daily ritual for many Americans, providing that extra get-up-and-go before starting their routines. But, coffee could be more than just a good way to start the day for older individuals at risk for dementia; daily coffee consumption protects against the development of dementia, according to a new study. The study, completed at a Veterans Affairs Hospital in Florida, was a retrospective evaluation of 124 people aged 65 to 88 years. At the beginning of the study, all patients underwent a battery of neurologic and cognitive tests and were categorized as having normal cognitive function, mild cognitive impairment (MCI), or dementia. Fasting blood samples were also taken at the beginning of the study. The researchers assessed the participants' cognitive functions annually for the next 2 to 4 years. At the end of the follow-up period, the participants were categorized into five groups based on cognitive function: initially normal function and remained normal, initially normal but converted to MCI, initially MCI and remained MCI, initially MCI and converted to dementia, and initially dementia and remained dementia. The researchers assessed caffeine levels at baseline and compared them to the cognitive function of the participants over time. At the beginning of the study, patients with MCI and dementia had lower plasma caffeine levels than those with normal cognitive function. Over the course of the study, patients with normal cognitive function who converted to MCI had lower caffeine levels than those who remained normal. Similarly, patients with MCI who converted to dementia had lower caffeine levels that those who remained MCI. Of the patients initially classified as MCI, none of those who converted to dementia had plasma caffeine levels above 1200 mg/mL. Half of the participants with stable MCI had higher levels. The authors suggest a protective effect above the threshold of 1200 ng/mL of caffeine — the equivalent of consuming 500 mg of caffeine or 5 cups of coffee daily. Caffeine is not the only factor that contributes to the development of dementia. Coffee itself is rich in antioxidants and anti-inflammatory compounds that reduce the risk for dementia and Alzheimer's disease. Also, physical activity, cognitive engagement, and hypertension also contribute to the development of dementia. This is not the first study to suggest that coffee may have therapeutic potential for cognitive function. The psychostimulant properties of caffeine have demonstrated reduced or delayed cognitive decline, especially among older people. But, it is still not clear if it is coffee, caffeine, or a combination of the two that provide the protection. In one study, caffeine solution (not coffee) and decaffeinated coffee did not show protective effects on cognition, while regular, caffeinated coffee did, suggesting that there are other components in coffee that synergize with caffeine to ward off dementia. No study on the effects of caffeine on dementia has proved cause and effect, but the studies are observing increasingly quantifiable results regarding caffeine consumption, and future studies are likely. For now, older adults at risk for dementia should not replace all other drinks with coffee (there are other health risks associated with that much coffee consumption! ), but an extra cup o' joe with some friends could do more good than harm. Image via Tischenko Irina / Shutterstock. NSAIDs – Prevention or Just Delay of Dementia?